This blazing scrawled filefish was defending a nest, we think. Dive Journal: We all do another late morning at the house, and Linda and I study the notebooks around the house that describe nearby shore dives. We finally decide to give one a try called North Star. The site is located west of Cane Bay, but the entry looks OK with only mild surf over some rocks and rubble. We take a 330° heading on a surface swim to an offshore buoy, then swim further 6 to 9 minutes due west with the depth around 35 feet. Finally we submerge and head a bit further north, following the wall downward to about 65 feet. We are nicely rewarded with a near vertical wall as we turn back east at depth. We come across a hollowed out cavern in the side of the wall and take a look. There is a huge green moray eel perched on the floor, sitting fully exposed, covered with gobies. We are very careful not to disturb him and I get some dark video, lit mostly by our small day dive lights. We then see an unusual type of lobster huddled up in crevices near the top of the cavern and go closer to inspect. They are red banded lobsters, this is the first time I’ve ever seen them. Paul Human writes that these guys are both uncommon and wary. We continue to explore the reef east of the cave for another 15 to 20 minutes, finally vectoring back on a heading around 160 to 180° to make it back to the parked car. 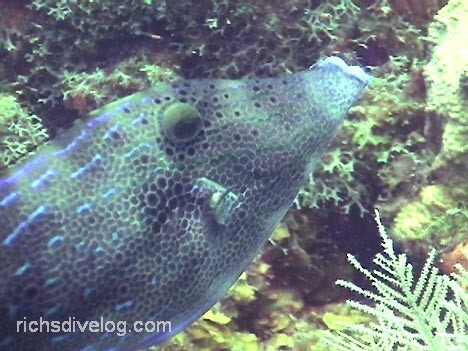 In one shallower reef area, we come across a vibrant scrawled filefish with brilliant blue streaks. We decide that he is guarding a nearby nest, for he clearly is trying to intimidate us away. Added to all this, we spot a fleeing turtle at the very end of the dive. Great dive!